It was all Virtually Pets on Sunday, April 20, Long Beach was teeming with terriers and tabbies awaiting forever homes. Many thanks to the volunteers who contributed to both of these events and to the good people who took a new friend—or friends—to forever homes. Gelson’s Jeff Stein, the event’s organizer, with his assistant, Bruno. …and West Coast Animal Rescue, here with Animal Match Rescue Team volunteer Louise Montgomery, organization founder Sherri Stankewitz, and volunteer whose name I didn’t catch, managed to be in two places at once that day. Good Neighbor Park hosted The Pet Post’s (that other one!) Second Chance Adoption Event. Participants included vendors, animal-welfare organizations, entertainers and, most importantly, many rescue and adoption organizations. Doug Erickson, founder of The Pet Post and organizer of the event, said that 18 pets–14 dogs and four cats–were adopted on that day, instead of the 15 he reported at the event’s end..
Erikson said that we could actually double the number of adopted pets from however many found a home. “We had 15 adoptions, which means that there’s one more space in each rescue for each pet adopted out. That means 30 lives saved!” Even better, we can now say 36. Second Chance event organizer Doug Erickson (center) with entertainer Noel Hamilton and Kim Swartz, assistant to Super Smiley, guest doggie (below, with human companion actress Megan Blake). …and they also brought in some dogs to adopt! This is Minne, age 6, and Chica, age 3. Find them on our shelter page. Dawn Weller, Friends of Long Beach Animals (FOLBA) board member, and Nona Daly, vice president. See Pet Projects for their next big event! The pet parade featured adoptable animals strutting their stuff . Here’s Animal Match Rescue Team’s ubervolunteer Faye Costigane with Jessica, 2, and Roxanne, 4. AMRT meets at Petco on Second Street and PCH every Sunday from 11AM to around 1PM. Clarissa, age 1, was calm enough to participate in the parade. 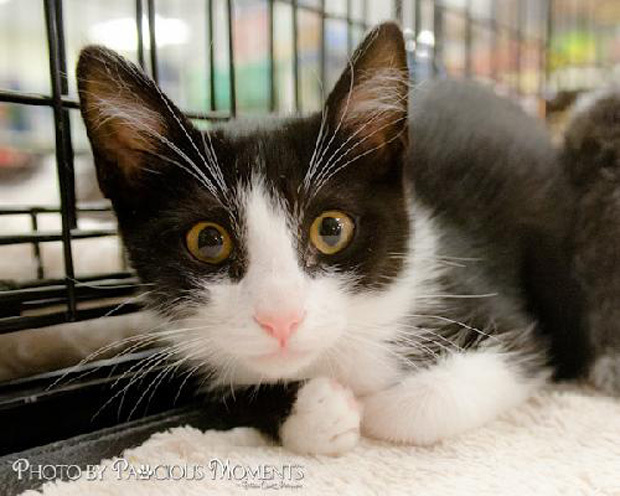 You can find her at Found Animals’ Adopt & Shop in Lakewood. Diane of Golden Retriever Club of Greater Los Angeles stands for the camera with her own two pets (sorry, not available. Diane says that stray golden retrievers in Taiwan are as plentiful here as Chihuahuas and pit bulls. Her organization has developed Project Taiwan, which flies adoptable goldens here for rescue and rehoming. WeCARe, who showed up at both events, takes in a lot of animals who have suffered abuse and physical damage. This is TJ, who was found in a garbage can in Mexico. 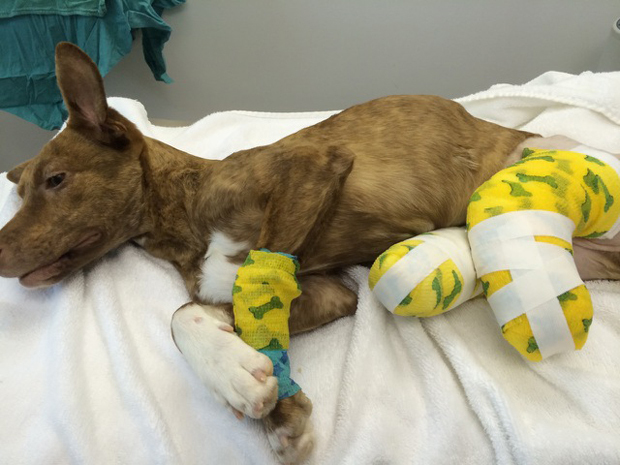 He had been attacked and shaken by a bigger dog and lost the use of his legs. TJ recently got his own wheels and is, surprisingly and happily, playful and social with both people and other dogs. Bruno, 3, from the German Shepherd Rescue of Orange County. Parker, an adult male beagle mix from spcaLA. This may seem like an oxymoron, but 6-year-old Shorty is a dwarf St. Bernard. There are bigger ones! See them all at Sunny Saints. Whole lotta lovin’. Jack, available at Kitty Catchers. And Callum is described on Kristie Brewer’s Making Biscuits http://www.makingbiscuits.org as an “extra-large adult.” Yes. As sweet as he is big. On March 26, a Belmont Heights resident left a post titled “Wily Coyote in Our Neighborhood” on the Next Door Belmont Shore community page. Linda Pemberton wrote the following: “At 10 am this morning a healthy well-fed looking coyote ran down the middle of Vista and turned north on Roycroft and ran into someone’s yard mid-block. Word on the street has it that this character has been around for a couple of weeks. Be aware.” Neighbors posted comments (the last one was April 10, just a few days ago) confirming the sighting. One neighbor reported a coyote at the corner of Vista and Roswell in the evening and again in the early morning on Broadway while walking her dog, and another saw the animal on the 200 block of Claremont. Coyotes were also spotted near Loynes and Bellflower and in Recreation Dog Park on Seventh Street. Keep an eye out. 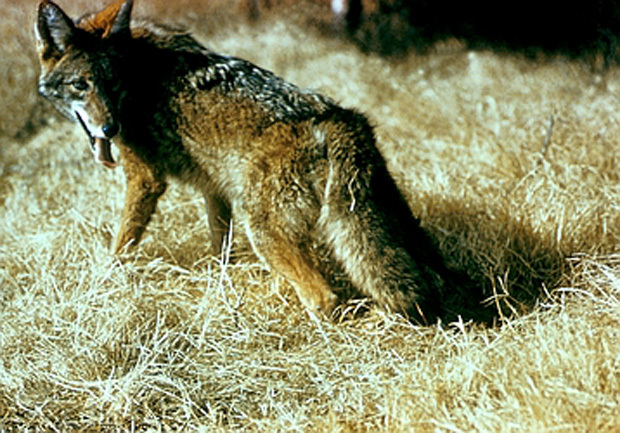 Urban coyotes result from urban sprawl. Construction in areas where wildlife species formerly have lived have flushed them all out—raccoons, skunks, opossums, and coyotes—to look for rapidly decreasing prey. They’re all very hungry, and coyotes have the advantage of also being very smart. This is a deadly combination for pets, so keep them indoors and keep an eye out when you’re walking the dog. If a coyote appears, engage in a practice called hazing, which involves such things as yelling, waving your arms, throwing things and using noisemakers (this is your chance to carry around a kazoo and play it in public). Long Beach Animal Care Services (ACS) offers a number of suggestions and encourages people to call (562) 570-PETS if one is spotted. A 9-1-1 call would probably be a good idea, too, if you feel in danger, although that’s my own suggestion. Keep an eye out for neighborhood meetings to educate people on the issue. The urban coyote issue presents a dilemma for advocates of every stripe, spot and scale of animal. The California Department of Fish and Wildlife (formerly Fish and Game) does not offer the option of relocation and prohibits trapping, but if it’s between my pet’s life or a child’s safety and keeping within state guidelines, I know what I’d do. At any rate, be aware and informed. The last Pet Post article involved a couple of cases of extreme animal abuse. Since then, we’ve gotten another case, one that involves Cheyenne, a dog rescued by West Coast Animal Rescue (WeCARe), which takes in extremely hard cases. I still can’t bring myself to write about what happened to this poor dog, but she’s actually doing fine, considering the situation, thanks to the veterinarians at the Newport Beach Veterinary Hospital. WeCARe’s founder, Sherri Stankewitz, said that she took her first step this week in her casts and are still fund-raising for a wheelchair and prosthetics (click here for details). The video is posted here, but note that it contains gruesome and upsetting elements. In the spirit of the animal community’s concern for animal welfare and prevention of animal cruelty, author and humane educator Deborah Turner and Friends of Long Beach Animals (FOLBA) are joining forces with the Long Beach School District to offer free humane education classes for parents as well as classroom presentations for grades pre-K–12! Parents will learn about kindness and care for pets. Teachers are also invited to book their free presentations for classrooms as well. The curriculum, approved by the LBUSD, are informative and timely with regard to events around the city, as they help both children and adults learn about compassion for and kindness to animals in these hourlong presentations. For information on the curriculum and booking, e-mail [email protected]. Read about the program here. The new Long Beach-Ximeno Unleashed by Petco store is kicking off its grand opening celebration with pet adoptions, a special pet photo booth, free giveaways, and more. As with all its stores, the new Petco Unleashed will deliver an engaging experience shopping for everyday pet essentials at a location closer to home, with the addition of an easy self-serve dog wash so that pet parents can truly have a one-stop shop for all their pet’s needs. The store will host several community gatherings throughout the year, including adoption events aiming to unite the area’s shelter pets with forever homes, Pug-a-Palooza, local dog meet-ups, and other fun contests and social gatherings for people and pets alike. Dog parks are great for canines and humans for running free and socializing. But just as any recreational facility, using it is a privilege and not a right. Learn how not to be one of those dog owners at this class, which will cover understanding and recognizing good and bad behaviors, thus encouraging positive interactions at the park. Humans only; a $10 fee applies. Gelson’s, the super-community supermarket, will host the third West Coast Animal Rescue and Long Beach Spay and Neuter Pet Adoption Day, along with our shelter at Animal Care Services (ACS) and Friends of Long Beach Animals and Fix Long Beach will host information tables. Gelson’s will supply free samples from their pet partners and give away a free reusable bag and store coupons with any donation to these groups. For more information, contact Gelson’s Marketing Department, 818-377-6494. In its 13th year, this WALK will be a fun fund-raiser for responsible pet ownership, education and humane treatment of animals—all part of FOLBA’s mission. In addition to the 5K WALK, the event will feature animal demonstrations and exhibitions, animal rescue and adoption groups, entertainment, vendors of all kinds, food, a kidzone, special guests and many more features all designed to further the mission statement! Vendors are encouraged to print out and submit the form found on this page. FOLBA is a nonprofit all-volunteer organization in its 23rdyear of serving Long Beach and Signal Hill with its commitment to saving animals’ lives through spay/neuter and education programs. For more information, visit FOLBA’s website.